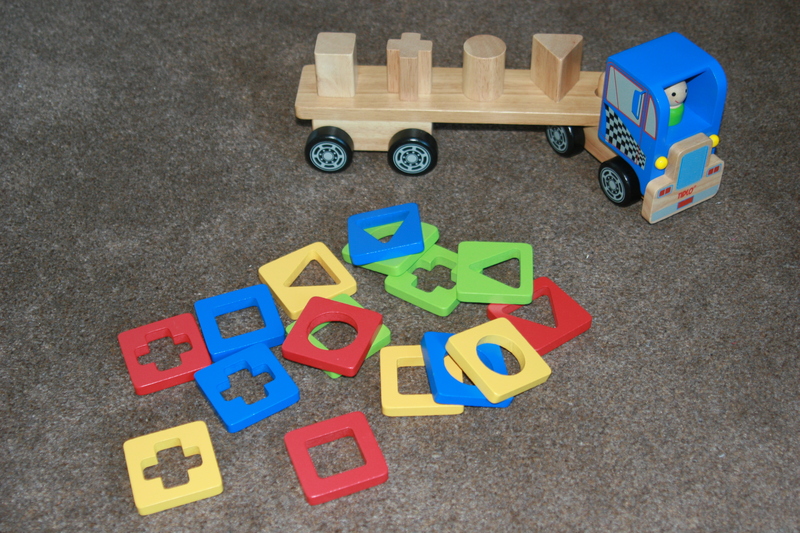 We were recently asked by Izziwizzikids.co.uk to review the Lorry Sorter by Tidlo for their weekly Playfest! This is a lovely wooden Lorry that can be described as two toys in one! Firstly it is a lorry; Cab and detachable trailer, the wheels go round and it is a much loved toy all ready that drives all over the house keeping both littlies entertained! Secondly, it is a shape sorter, and a great one at that! beautiful and the kids have really enjoyed playing with it. Both Legs (3.5 yr) and Mouse (23 months) play with this and it has fast become a firm favourite in the house! The lorry and shapes have been played with roughly (as only toddlers know how), bashed, crashed and dropped and so far there are no chips in the paint and no dents in the wood! It retails at £15-20 and I would say it is well worth the money, the amount of play we have had out of it so far in the couple of weeks we have had it has been immense! The kids love it, and I love the fact it isn’t plastic, doesn’t have lots of lights or buttons, yet still keeps them entertained for hours!